HomeFREEDOM“SPOTTING THE TRUTH” A Different Kind of Documentary!!! Help make it HAPPEN!!! “SPOTTING THE TRUTH” A Different Kind of Documentary!!! Help make it HAPPEN!!! … a film about vaccine injury and the benefits of natural immunity. We need your help to make this film happen and if this is done properly, it will blow the lid off of all the lies used to promote and mandate vaccines. Take a look at the project and if you can help in any way feel free to contact me. Currently there is an outbreak of mumps on college and university campuses across the US, and to a lesser degree there is a measles outbreak in some states. We would like to get interviews with people impacted by these outbreaks. Also in need are interviews with families impacted by SB 277 in California, as well as males and females impacted by the HPV vaccine, families impacted by vaccine injury, and those who embrace natural immunity. Anything you can do to help for this ‘work in progress’ documentary would be greatly appreciated. Share this project, participate, and make people aware that the vaccine lie is over! I am a filmmaker in the process of creating a documentary titled “SPOTTING THE TRUTH!” We need to connect with non vaccinating individuals who are seeking natural immunity to the so called “childhood illnesses” of measles, mumps, chickenpox, and rubella for their families. Interviews before, during, and after individuals or families have contracted any childhood illness are needed. The best possible scenario would be interviews directly after exposure and documenting progress through an illness. Interviews initiated during a childhood illness are, of course, also welcomed and vital for the continued success of this project. All ages and family sizes are needed for the documentary. The public is waking up to vaccine dangers and the very real benefits of natural immunity. This is a very important project to help alleviate the fears of childhood illnesses once considered benign and necessary for proper immune development. I am also seeking exposure to all childhood illnesses for myself, not only because I’ve never had a single childhood illness, but because I would never expect anyone to do anything I’m not willing to do myself. I am keeping a video diary of any experience and using it as part of the documentary, as well as writing daily blog and posting periodic progress reports on social media. 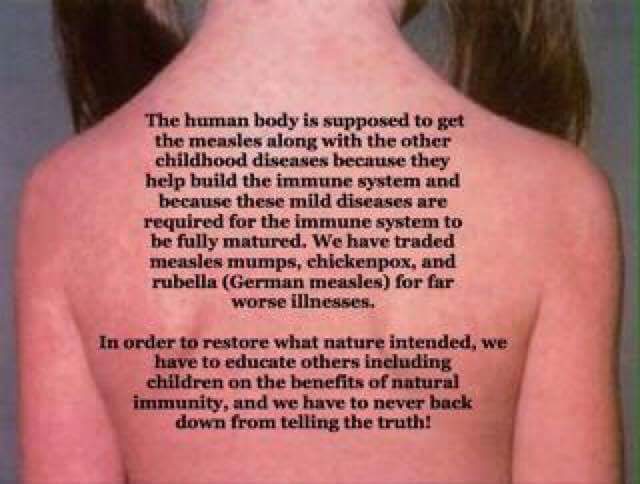 My goal is to silence one of the biggest lies used to push vaccines: Childhood illnesses are to be feared. We also need to speak with the countless families and individuals who have been vaccine injured. Vaccine injuries are far too common and in our opinion, happen 100% of the time following vaccination. While these injuries may not present themselves immediately they exist, as so many can attest to. These can include food allergies, physical and mental disability, chemical sensitivities, skin reactions, and the unthinkable–death! We will also be talking to medical experts that are advisers and contributors to The Liberty Beacon Project who are against vaccines and or the current vaccine schedule, to get their expert opinions on the issue of vaccination as well for this documentary. The plan is to do this after every other aspect of the project is completed. Both the CDC and pharmaceutical companies have a damning paper trail, which combined with other parts of my project could end the vaccine lie once and for all, but we cannot do it alone. Lastly, we need to explain that this project is being shot on mobile phones and consumer grade video equipment. Shooting the documentary in this fashion makes it possible to reach more people worldwide to tell their stories, and we can easily use my blog for updates on a regular basis.